Personal learning networks (PLNs) represent an emerging technology in education. Closely related is the concept of a Personal Learning Environment (PLE) which represents the technology that supports PLNs. 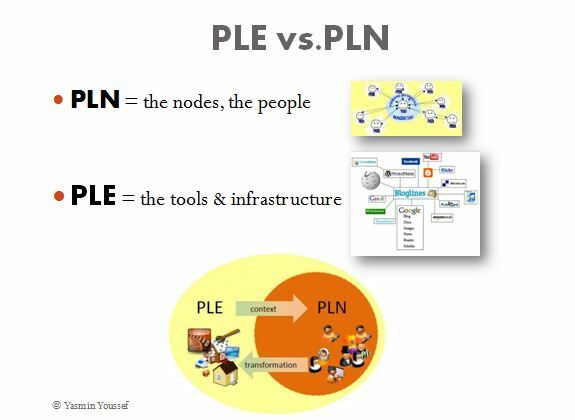 I like the picture, as it provides a good visualization of the difference between a PLE and PLN. An important thing to remember is that networks are about people, and making connections with people. If cultivate my PLN to support gaps in my formal education – I connect with people who can help me learn. I have a local PLN with professors and physicians that support my formal education, but I also have a connected network of academics and professionals around the world who share interests or are experts in areas where I need someone else's opinion. But for a PLN to truly work, there needs to be a give and take. You cannot expect to just cultivate information from others without giving something back – you need to share your expertise as well. The increase use of social media in education might explain the current edtech trend of PLNs. Although Lisa's article is a little dated, the tips are useful. This emphasizes that the concept of PLNs is not new; however, the growth in tools and the ease of use of current social media tools makes it possible for anyone to cultivate and display their own PLN – as Lisa's puts it, PLN producers or 2.0 skills. Personally, I've found participating in connectivist style MOOCs to be one of the best ways to cultivate my PLN. It is a great way to meet awesome brilliant people. Twitter is just one tool that can be used to foster a PLN. Personally, I find that I can often get quick answers to my questions by tweeting out the question. To help foster my twitter PLN, I also follow a few chats (e.g. #PHDCHAT) and am sure to answer other peoples' questions when I can. That way, I'm not just taking from the network, I'm also contributing to it! This article provides an interesting theory on how you might adopt the PLN. I can relate to a new technology becoming a time sink and the need to find balance. Social media is especially bad for this. I'm not sure I believe that we will ever be without the LMS, the PLE tools provide a mechanism for learners to take control of their own content.